One thing we do very well is plums. The autumnal plum is a juicy sweet crimson jewel that has to be fully enjoyed at this time of year – there is no point in bothering with the hard round rocks you find in the supermarket the rest of the year. We had our first one off the tree the other day, the taste stops you in your tracks transporting you to childhood memories of harvesting baskets of the fruit – only half making it back to the kitchen. The plums we are talking about here are Victoria plums (other plums being Greengages, marjorie’s seeding, and Damsons) which are more oval in shape with crimson to yellow skins with a soft, sweet golden flesh compared to the dark skinned round imported plums, so make sure you pick up the right ones. When the plum is so fresh and delicious there is nothing more wonderful than enjoying it on its own, perhaps in the morning with a bowl of granola and a dollop of yoghurt, or lightly poached spooned over a steaming bowl of porridge on a cooler morning. They are so sweet they can easily replace that chocolate biscuit mid afternoon. And of course they are magnificent in deserts. Pies, tarts, cakes, crumbles, sorbet, jam’s, compotes – take your pick. This is superb cake that we have been making for years, one that you forget about post November then we excitedly remember about late summer – it is heaven, especially when still warm from the oven served with vanilla ice cream. You can serve is as dessert or simply as a cake for afternoon tea. An easy plum dessert, like its soft fleshed friends – apricots, peaches and nectarines is to cut them in half, remove the stone and roast them at 180c. We often do this simply with soft brown sugar, marsala wine, a drizzle of olive oil and a few sprigs of thyme. Or we love Sarah Ravens recipe which is with orange and lemon zest, dark drown sugar, cinnamon, bay leaves and a few juniper berries. 1. Pre heat oven to 180c and line an 8inch springform tin 2. First make the crumble – put all the ingredients in a food processor and blitz to form a crumble, leave to one side. 3. Beat the sugar and the soft brown sugar together in a bowl, add the ground almonds, flour, eggs, yoghurt, vanilla and baking powder and combine. Pour mixture into the tin. 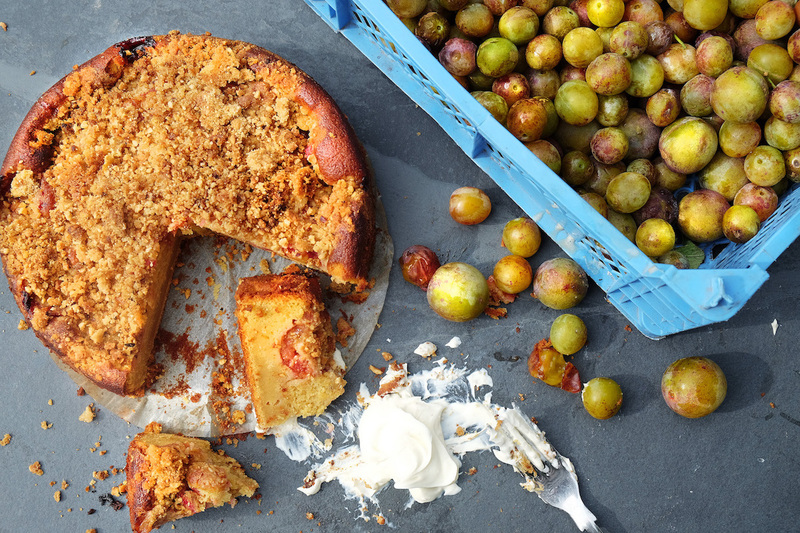 Dot over the plums – really squish as many as you can in and sprinkle over the crumble. Place in the oven for 30 – 40 minutes. Leave to cool and serve with crème fraiche.